The fame of Portugal’s Douro Valley rests on its Port wines. The world’s most famous fortified wines are aged in the Lodges of Vila Nova de Gaia at the mouth of the River Douro, but the vineyards lie on steeply-terraced hillsides much further upstream. Recent years have seen a rapid expansion of a second wine style made from these grapes: high quality still table wines. Though most are red, made from traditional Port grapes like Touriga Nacional and Touriga Franca, a sprinkling of excellent white wines has also appeared, grown on the higher, cooler, often north-facing slopes. In the early 1980’s, Douro producer João Carvalho Maia visited the Napa Valley and had the opportunity to work the harvest at Schramsberg Vineyards, perhaps the USA’s best-known producer of traditional method sparkling wines. At the end of the harvest, João invited Schramsberg’s owner, Jack Davies, to visit Portugal and advise on the potential for sparkling wine. Davies did so and, impressed by the potential, returned the following year with his winemakers to carry out micro-vinifications and choose the most suitable region for the production of sparkling wine. The Minho (Vinho Verde) and Bairrada, were considered alongside the Douro. This process was repeated for three years until the granite soils of the Cimo Corgo, at an altitude of 550 metres in the Douro, were chosen. In June 1989, Caves Transmontanas and its brand, Vértice, were born. 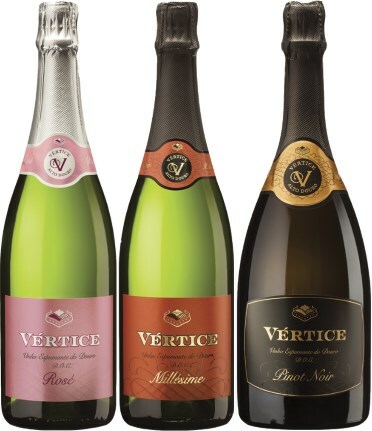 Vértice’s sparkling wines are all made by the traditional method, with secondary fermentation in individual bottles. Since they began in 1989 the company admits that it has been a learning process, with the grape varieties and the blends used for the base wine being tweaked to improve body and complexity. They have also increased the time on the lees across the range, both detail-driven actions aimed at improving quality, with some cuvées spending a full seven years on the lees. Vértice’s Head Winemaker is Celso Pereira, who has been on-board since the very beginning, participating in those early Schramsberg experiments. Celso also worked a sparkling wine vintage with Schramsberg in Napa, as well as at Pierro Vineyards in Margaret River. There is some barrel fermentation and ageing of the base wines, reserve wines are included to give depth and complexity, and both indigenous varieties like Gouveio, Rabigato, Códega and Viosinho are used, as well as Chardonnay and Pinot Noir for some cuvées. I tasted five of the six sparkling wines produced (only the vintage Chardonnay was missing from the line-up). These were extremely impressive I must say. Most Portugeuse sparkling wines I have tasted previously have come from the elevated vineyards of the Dão region, but these set a new benchmark for me, and also offer outstanding value for money. These wines are imported and retailed by The Wine Line, who will also be pouring their wines at my Glasgow Festival of Wine in June. (2018) This vintage Brut is a blend of Touriga Franca, Gouveio and Malvasia Fina, with a little Viosinho and Rabigato. It spends a full four years on the lees and has developed fabulous toasty richness - again I am guessing ther is a barrel-aged component in this blend. Moderately deep in colour, the nose is fresh with ripe nutty apple and some floral aspects. In the mouth there's an obvious sweet ripeness from the fruit, but there's nothing blowsy or cloying here, the buoyant, clear fruit cut through with a fat lemony acidity that is deliciously easy to drink into a long finish. The extra lees and bottle age makes this another stand-out bargain at under £20. Thank you Tom for always bringing new insights and interesting wines to our attention. Many thanks – surprising wines in many ways and well worth tracking down if you can find them. Hi Tom, Will these wines also be at The London tasting ? These wines sound interesting. I didn’t realize that there are sparkling wines from the Duoro. I’ve never seen them in the store, but be on the look out. Ned, I certainly haven’t come across many, but there are quite a few white wines around now from the high, cooler vineyards. The conditions have let Vertice make terrific sparkling wines from the vineyards, but I don’t suppose we’ll every see a huge sparkling wine industry in the Douro – it can’t be the easiest place to do so.